Twitter was buzzing recently as 140 thousand people shared information about what they plan to give up for Lent. While Twitter users are not necessarily representative of the general population, the results make interesting reading. 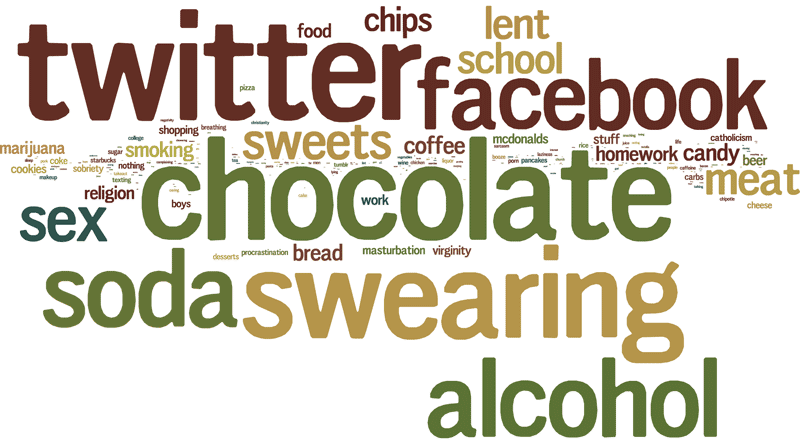 Using social media, eating chocolate and drinking alcohol are high on the list. Ranked 11th is giving up Lent itself. Looks like we know our soft spots well – the places where we give in to self-indulgence and carry a bit of guilt. For years I put myself alongside those who gave up giving things up. I have dabbled in giving up chocolate, or coffee, but I usually struggled to stay committed. You see my heart has not been in it. Lent carries us directly to Good Friday where we remember the suffering and death of Jesus. In contrast to this, my small attempts at self-denial felt trivial and led me to nothing that was remotely life changing. I couldn’t see a meaningful link between chocolate and crucifixion. The church I attended paid little attention to Lent. Easter for us at that time was about Holy Week – but it all seemed to happen too quickly. The momentum of life charged on and I was left once again feeling cheated. This was a big moment and I missed most of it. Lent draws us in. We share an unspoken belief that self-denial is a good thing to do and 40 days feels like an amount of time that can be endured. Some of us use Lent to kick-start change in our lives. Others use it as a way of proving to ourselves and to others that our self-indulgent habits are reversible. We reckon we are in control of what we choose to do. And we believe that the tension between self-control and self-indulgence can be mastered. After all, we cheered through the Olympics as countless athletes panted through their victory speech, elated at their success and struggling to believe the unbelievable. And yet there is a spiritual dimension to Lent that we also acknowledge. All of the major religions recognise a period of fasting for the development of the soul. This is about taking time to reflect on who we are becoming. It can be serious stuff. The ancient ascetics gave their lives to the pursuit of this spiritual maturity, practicing harsh penances and purging themselves of all comfort. Our meagre 40 days of giving up a few pleasures would be wholly inadequate in their eyes. The story of Jesus’ 40 days in the wilderness is sobering. It shows us that the battle against self-indulgence is part of being human. We constantly face temptation about who we are, what we own and what we do. Our choices have consequences. So how can we engage with the tension between self-indulgence and self-control and use Lent in a meaningful way to gain some spiritual muscle? Here are two resources that link together ancient spiritual practices with modern technology and amazing people. Together they have been transformational for me. First I have read and re-read The Liturgical Year – the spiralling adventure of the spiritual life. This is a book written by a Benedictine nun that explores the liturgy – the major seasons of the church. In the liturgy, with its annual repetitions, we meet Jesus in history and we learn to recognise him with us today. Far from being a round of Christmas and Easter celebrations, walking in an annual cycle through the life of Jesus becomes ” an adventure in bringing the Christian life to fulness, the heart to alert and the soul to focus . . . It concerns itself with the questions of how to make a life”. Seeing the rhythm of the years from the perspective of Jesus’ life keeps me focussed on God’s bigger picture. It reminds me of the significance of time. It helps me to understand who I am and to explore the purpose of my life. And the second change for me has been to engage with a rhythm of prayer, specifically to pray the Lord’s prayer at midday every day. I discovered the richness of this through 24-7 Prayer, an organisation that exists to encourage Christians in bringing prayer into all aspects of life. This online community has been an enormous encouragement to me. Many christians run away from set prayers that could become a religious ritual. But the Lord’s Prayer is deeply significant. It challenges who I am, what I believe and how I behave. And best of all, it reminds me at the very beginning, that I am a child of God. Rowan Williams, former Archbishop of Canterbury, was once asked, “If you could reduce all of Christianity down to the back of a single envelope what would you write?” To which he replied: “Well that’s simple, I would write out the words of The Lord’s Prayer”. The 24-7 community gave us a challenge to set an alarm on our phones and pray the Lord’s prayer with them at midday every day. Have a look at the website here and consider whether this might work for you. The challenge is for life, not just for Lent. How do you make Lent meaningful? This entry was posted in Books, Lent, Resources and tagged 24-7 prayer, Christianity, Easter, faith, fasting, Jesus, Lent, Liturgical Year, prayer, twitter. Bookmark the permalink. Hi, Thank you for commenting and sharing Henri Nouwen’s clear thinking and thoughtful prayer. He says in a few words what so many of us long to say. I love the way he can clearly express the desires of our heart. What I value about the 24-7 prayer plan is that it gives an achievable step forward, moving me from feeling the burden of my problem to engaging in new routines that help and heal me.